Moritz Kaposi was born as Moritz Kohn in Kaposvár, chief town of a county in Hungary. His father was employed by the local Jewish community. He attended primary school and grammar school at his native town, but after his family moved to Pozsony (Pressburg, now Bratislava, Slovakia), the former capital of Hungary, he got his baccalaureate in this city. He enrolled in the Medical Faculty of the University of Vienna, Austria, in 1856, where he became MD in 1861 and later, according the rule of this era of high education, Master of Surgery (1962) and then Master of Obstetrics (1866). He was impressed by the new ideas and practice of the so-called Second Viennese Medical School, led by Carl von Rokitansky, Joseph Skoda, and Ferdinand Ritter von Hebra. From 1861 to 1863, he was resident at the Allgemeines Krankenhaus in Vienna, one of the most important teaching hospitals in Europe, and thereafter he was for 3 years employed by Louis Sigmund, a famous Viennese private syphilologist, until he became in 1866 assistant professor to Ferdinand Ritter von Hebra and in the same year honorary lecturer at the Department of Dermatology, University of Vienna. 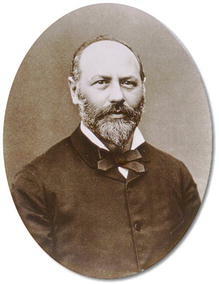 Professor Hebra was the founder of scientifically based dermatology in Vienna, and his activity influenced the development of dermatology in other countries as well. Hebra recognized the talent of his assistant and choose him as co-author of his Textbook of Dermatology. In 1875 he got the title of Clinical Professor of Dermatology, and from 1881 to his death, caused by stroke in 1902, Kaposi acted as full professor and director of the same department. In his private sphere, Moritz Kohn converted to Catholicism and married Martha Hebra, Ferdinand Ritter von Hebra’s daughter, in the late 1860s. In 1871 he changed his family name to Kaposi referring to his native town and his first name to Mór, referring to his Hungarian nationality. Kaposi was popular and beloved by the Viennese high society and a welcome speaker at international congresses, first of all in Paris. He spoke fluently German, Hungarian, English, and French. Kaposi was one of the founders of the Vienna Society of Dermatology, the German Society of Dermatology, Honorary Member of the New York and of the London Society of Dermatology, the French Society of Dermatology and of the Royal Hungarian Medical Association, and Member of the Academia Leopoldina in Jena. The Emperor Franz Joseph made him a Hofrat (member of the privy council) and donated him knighthood of the Imperial Order of Emperor Leopold. He was awarded the French Ordre de la Légion d’Honneur. The county hospital in his native town is called now Kaposi Mór Teaching Hospital. The Hungarian Post edited a stamp with Kaposi’s portrait at the occasion of the International Cancer Congress in Budapest, 1986. In Vienna the street “Kaposigasse” and a street in Kaposvár “Kaposi Mór utca” are named after him. Kaposi’s professional career started with investigating the etiology, diagnostics, and therapy of syphilis. His thesis for being honorary lecturer dealt with the topic “Dermatologie und Syphilis,” and later on he continued his activity in both dermatology and syphilology. However, discovery of numerous dermatological entities and classification of newly found and already known diseases of the skin are his most important achievements to medicine and dermatopathology. In collaboration with his good friend the pathologist Salomon Stricker, Kaposi investigated skin alterations both grossly and by histological examination. These studies resulted in a significant development of dermatology, renown by leading dermatologists all over Europe and in the United States. Kaposi published 156 papers on his new findings and was the author of textbooks like Pathology and Therapy of Skin Diseases (1880, translated from German to English, French, and Russian) and Pathology and Therapy of Syphilis (1881) as well as of the Atlas der Hautkrankheiten (skin diseases) (1898). Kaposi was first to describe a series of dermatologic diseases like lichen scrophulosum, rhinoscleroma, xeroderma pigmentosum, lichen ruber moniliformis, and impetigo herpetiformis. He was the first to separate the entity of lupus erythematosus disseminatus (LED) from other lupoid lesions and defined it as a generalized multi-organ lesion. Kaposi’s most important achievement is the description of five cases of sarcoma cutis idiopathicum pigmentosum multiplex (1872), named after him as Kaposi sarcoma on the suggestion of E. Köbner in 1891. The tumor Kaposi described was the “classic” or sporadic type occurring mainly in the skin of elderly men. Since the mid-1900s, endemic Kaposi sarcoma in Middle Africa is being diagnosed, and later, parallel with AIDS, Kaposi sarcoma occurs frequently in certain groups of the population all over the world. This tumor can also be found in patients receiving immunosuppressive therapy after organ – mainly kidney – transplantation. While the sporadic type develops in the skin of the lower extremities, forming slowly growing reddish-brown nodules, the other types grow more aggressively and form multiple nodules in the skin as well as internal organs like the kidney, liver, and lung, leading to death. Histologically Kaposi sarcoma is a soft tissue tumor formed by round or elongated tumor cells and proliferating capillaries. The reddish-brown color is due to hemosiderin derived from patchy bleeding caused by leakage from the fragile capillaries. Evidence is increasing for a type of herpes virus (herpes virus 8 = KSHV, Kaposi sarcoma-associated herpes virus) as causative agent of Kaposi sarcoma. The occurrence in immunocompromised patients, especially in HIV infections, made Kaposi’s name worldwide known (Fig. 1).